Starting a business isn’t easy – and it certainly isn’t cheap, either. There is a real need to trim costs and keep the budget down, especially within the first year. You need digital marketing tools to help you grow, but you also need to be cautious about where you spend your capital. Some tools promise you the world, yet deliver very little in actual benefit at the end of the day. We want to help you drill down and figure out what’s most effective, helpful – and preferably, free. Everything on this list is startup-approved. Google Analytics is Google’s flagship platform for website owners and digital marketers. With a simple login, you can track performance and SEO across every single one of your websites or platforms. Nearly everything is free, with a few “freemium” offerings for advanced analytics. You’ll rely on this one often. Slack is a cloud-based collaboration platform that doesn’t necessarily help you digitally market your brand – instead, it helps you communicate with team members from anywhere. Track tasks, host e-meetings, schedule projects, and use plugins to automate mundane tasks. This one is a must for anyone using remote workers. MailChimp is a “freemium” email marketing and marketing automation platform with near-legendary status in the digital marketing sphere. Use it to manage your campaigns, track statistics (like opens), automate mail outs and so much more. It’s free to get started with MailChimp. Once you reach a certain volume of subscribers, however, you will need to subscribe for a volume-based fee. Canva is a graphic design tool and platform “designed” for people who have absolutely no experience with imagery. Subscription is extremely cheap and gives you instant access to thousands of templates and images for everything from social media branding to posters to letterhead and more. Use this to quickly create graphics without paying a designer thousands before you can afford it. AnswerThePeople.com is a unique and rather new platform that uses deep analytics to search the web for what people are really asking – giving you the opportunity to address those needs in your content or with new products. What’s really special about this one is the fact that it displays questions in a really cool visualization layout, making all of that data easier to digest and work with. Just enter in a couple of keywords and you’re good to go. Thinking about working with Influencers? Influencer Marketing Hub’s free Audit Tool will help you verify your chosen influencer’s follower list, engagement statistics, and overall truthfulness about how beneficial they’ll really be. Do they have real, loyal followers, or just a long list of purchased fakes? Find out in seconds; all you need is their Instagram profile link. Results are free! 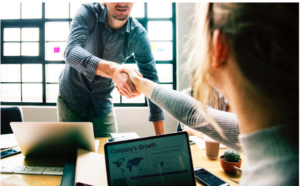 Making your way through the first five years of business isn’t easy, but it’s also the best time to start making solid partnerships for the future. Contact us at Go Digital WSI for help.